I love good food, but I don't like to spend hours preparing it. In fact, when I get a new cookbook, I often fantasize about visiting the author because that's the only way I'll eat most of the recipes. They simply require too much time and energy. So when Jaime Hartman got the idea for this e-cookbook, I was all in! Every recipe is a full meal that can be made in 30 minutes or less. How awesome is that? Whether you're new to the paleo autoimmune protocol or an AIP veteran, you just got a new best friend in your kitchen. 120 Complete 30-Minute Meals. You'll find one-pot meals, sheet-pan dinners, and also quick main courses and side dishes that are easily cooked simultaneously. That's 30 Minutes Start to Finish. It includes both preparation and cooking time. 100% AIP. 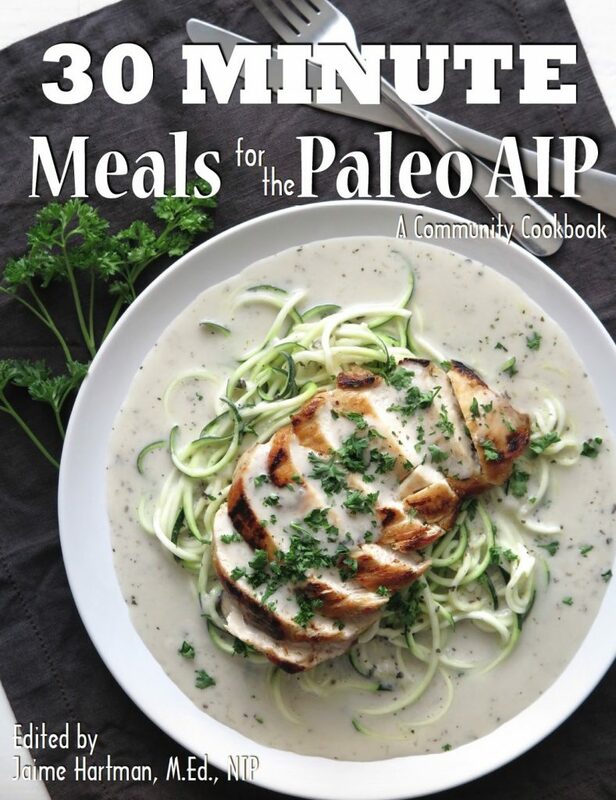 Every recipe in this e-cookbook meets the restrictions of the elimination phase of the paleo autoimmune protocol. It's an PDF E-Cookbook: That means it's available to purchase worldwide. It's also formatted on 8-1/2×11 paper, so it's easy to print, if you prefer a hardcopy. $1500 Giveaway: To celebrate the launch of this book, we're giving away over $1500 in prizes! Just scroll to the bottom of the sales page, and enter before 8/13/18. 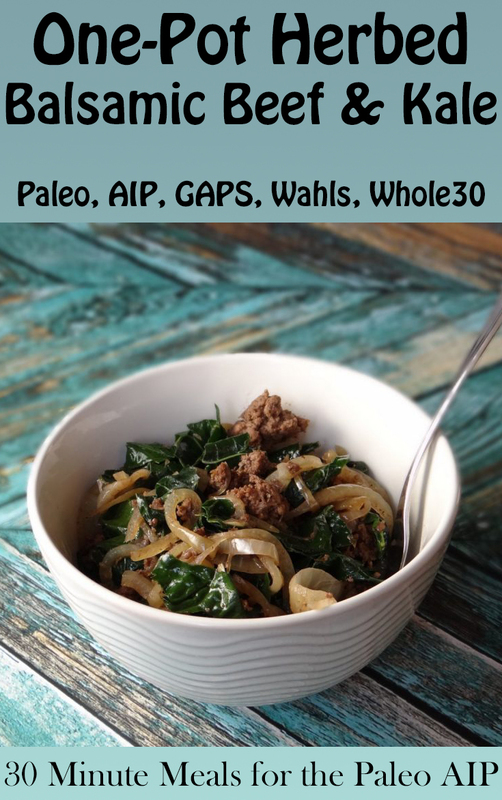 Recipes by 41 Paleo AIP bloggers and healthcare practitioners. 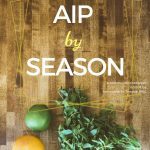 That means that every recipe was created by an expert in the protocol, many of whom have used the AIP to improve their own health. You'll find a huge variety of recipes, much greater than any one person could create on their own. There are famous names among the contributors (Sarah Ballantyne, Mickey Trescott & Angie Alt), but you'll also find inspiration from newer members of the community. It's wonderful how this movement has grown! I am one of the contributors, too. I donated two of my favorite recipes to this book, and I'm previewing one of them for you below. The 4th in a series of collaborative cookbooks. 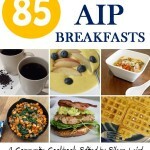 I started this tradition by editing the first two AIP community cookbooks: 85 Amazing AIP Breakfasts and The Paleo AIP Instant Pot Cookbook. Both are bestsellers! Then, Jaime Hartman from Gutsy By Nature took the torch. 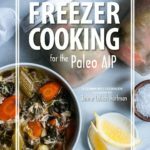 Last year, she edited and released: Freezer Cooking for the Paleo AIP and today: 30 Minute Meals for the Paleo AIP. Here's a sampling of recipe titles to get your taste buds watering: Apple Cinnamon Chicken over Smashed Sweet Potatoes, Quick Shepherd’s Pie, Skirt Steak Fajita Bowls, Chicken Tikka Masala & Cauliflower Pilaf, Sushi Salad, Caramelized Onion Tart with Prosciutto & Asparagus, Keep it Simple Salmon Spinach Skillet, and 113 more! Here's a complete recipe list. And remember, every single one of these meals can be made in 30 minutes or less. Peel and slice onion into thin half-moons and add to the pot. Stir and salt lightly. Cook 8 minutes, stirring occasionally. Meanwhile, combine beef with ¾ teaspoon salt, rosemary, sage, and thyme. Push onions to the edges of the pot and press beef in the center into a thin single layer. Cook for 8 minutes, flipping once. Meanwhile, remove kale leaves from stems and chop. When beef has finished cooking, break it into small pieces and stir to combine with the onions. Add balsamic vinegar and stir again. 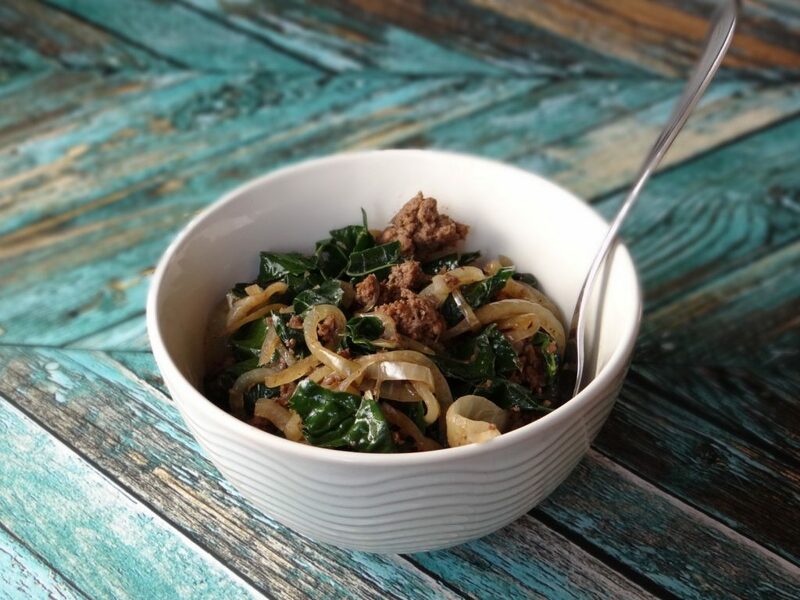 Place kale on top of beef mixture, but don’t stir. Cover and cook for 3 minutes. Stir the kale in with the beef and onions. Cover pan again and cook 2 more minutes. The winners were selected through Rafflecopter on August 14th and have all been contacted to redeem their prizes. 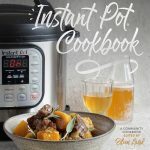 To celebrate the launch of this e-cookbook, there's a HUGE giveaway happening, with over $1500 in prizes. There will be 21 winners, and entering is easy. Just click over to the purchase page, scroll to the bottom, and follow the directions in the Rafflecopter box. The winners will be chosen randomly on August 13, 2018. Good luck!